I have a pretty cool role, I get to be surrounded by sport daily and get some neat little perks like this. Two weeks ago while in BC I had the opportunity to run with a really good Infinit customer Ed Kumar. Ed is all about the trails and ultras. After seeing some tweets of a race he had completed: Bucking Hell, I reached out to him, told him I was going to be out there for vacation/business in a couple of months. I asked if he would be willing to take me on some of his favourite trails on the Vancouver North Shore. Ed was cool, just let me know when you are in town and we can go. I have run new trails alone and that is fine, but always nice to run them with someone that knows the area inside and out, Eddy certainly does. He asked me: did I want to go with one continuous climb and then down or more up and down throughout our 2 hour 30 minute run. I chose the later, since I am from Windsor, an area that is as flat as the Prairies, the only hills I get is at Malden Park (old dump) or an overpasses. So my wife and I left Victoria on the 8:00 am ferry, we got to our meeting place, The End of the Line General Store in Lynn Valley right around 11. I was super excited to be running in the mountains, a bit pensive though, wondering if my legs would hold up for 2.5 hrs in the hills, would I be able to keep up? After our introductions, Eddy quickly gave my wife Brenda some suggestions for hiking while we ran. We headed off for our run. From the onset I was in glory. Warmish day, but in the shade of the monster cedars it was perfect. As expected Eddy took me up for bit, some so steep that you can't run, you had to power hike. Following our first ascent it was time to run down hill, this is where I was in trouble. Eddy was like a gazelle running down, fast feet speeding down making it look effortless. Me on the other hand, I was watching where I was placing each foot and wasn't carrying much momentum at all. Actually found it quite taxing on my quads. He waited for me to catch up and he gave me some quick pointers - lean or fall forward and look down the trail a bit. This is very similar to riding a mountain bike through trails, never looking down or at what you want to avoid. Took a leap of faith and started using the feedback provided, made a world of difference. Of course I never reached his down hill pace, but the gap was much smaller and I was pleased. So my first test was done, now we ascended/descended another couple of times - was absolutely incredible running. I am currently training for an October marathon, so I have been doing lots of road miles, this was a breath of fresh air for sure. Near the end of our run we head down to a section of Lynn Creek where there are pools, falls and a suspension bridge - we had about 2:20 in our legs - so walking right into the ~60 C water felt amazing. After our water break we headed back up to the General store where we hooked back up with Brenda. We sat and had an Ice Coffee and some yummy food, couldn't wipe the smile of my face. I understand now why those in the west live there. Incredible playground, you just want to be outside and active. I was really grateful that Eddy took the time to meet me and show me the ropes in Lynn Valley and Fromme. 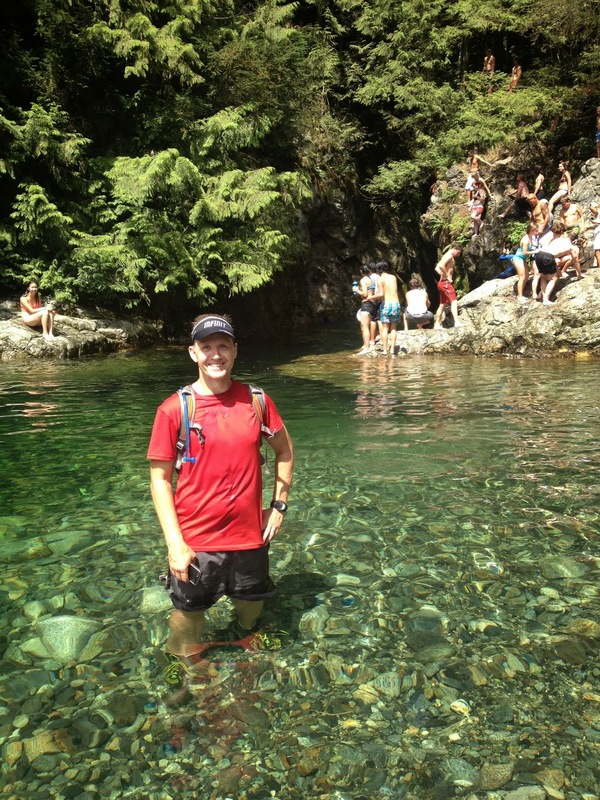 I know this weekend Eddy is participating in the Squamish 50 - a 50 k run through the same terrain we ran. To give you a sense of what he will have to endure - our run was just a bit under 2.5 hrs we covered 17 km, with 686 m elevation - they will be covering 50 km with 2500 m elevation. Ed is the logistical coordinator for the 50 miler which starts Saturday it has 3500 m elevation. I have a new found respect for ultra trail running, I have done a few 50 k trail runs, never with the elevation gains experienced here though. Best of luck this weekend Eddy and thanks again for showing me the light. Ironman Fuelling on Infinit. Simple and Safe! I have personally used INFINIT for 4 Ironmans. Here I will provide you with my actual experiences so you can learn from me and optimize your plan for your next big race. A little background info I take all my calories on the bike from INFINIT, ensures the osmolality (concentration) in my stomach is suitable for easy absorption across my small intestine, no inference with salt or calories from other sources. I aim to consume 2300 calories on the bike. I sweat immensely. Two Approaches To Consider Superconcentrate – Mix 8 scoops of your blend into each INFINIT Bottle. Take two on the bike and make an extra for special needs (just in case!). Place the extra bottle for special needs in large ziploc with two frozen water bottles to keep cool. During the Bike take in about 1/9 of the bottle every 20 minutes and follow with water immediately. Notes: Using this method relies upon chasing your INFINIT with clear water after every drink, this will get it back to the intended concentration, so it can be readily absorbed and you stay adequately hydrated. Make certain you take the time to calculate how much water you will be taking in if you are sipping on an aero-bottle straw. I used this method in 06 at Lake Placid and didn’t calculate until after as I searched for the reasons that I was dehydrated after the race. I recommend you do a sweat test a couple times during your training season to see what your water loss is per hr for different conditions (hot and cool). Pros/Cons: Minimal weight for the bike on hilly courses. Easy to take in 2000+ calories on bike. No stop at special needs. If chase amount of water is not calculated/practiced, dehydration can result. Normal Concentrate - Prepare 4 bottles at normal concentrate (2-Scoops each) for start of bike. Place 3 bottles on bike and empty one into aero-bottle prior to starting race. Prepare 3 bottles at normal concentration and one at double concentration for special needs. Place bottles in ziploc bags with frozen water bottles. Notes: Using this method is simple and requires no thought while on course. I used this at Florida last year when I knew the weight wouldn’t be an issue on the flat course, I wasn’t well trained, but had my best race nutritionally ever. I supplemented with water as well, in addition to the INFINIT water, I took in 300 ml of clear water every hour. Pros/Cons: Safe, no thinking required on course. Easy to take in 2000+ calories on bike. Requires stop at special needs (30 seconds if done right). Extra weight on hilly course. Both of the above methods are great ways of setting yourself up for a great run! Both need to be practiced. Remember the number of calories is athlete specific; you may not need 8 servings, only race on what you have practiced in training. This advice was given to me and I recommend this to any Ironman athlete: Conserve your energy and fuel your body the best you can through the swim, the bike and the first half marathon, to allow for your best possible last 13.1 miles. For race day, you can also consider ordering your endurance formula and dialing the flavour way back to the left. Your concentrate will not be a strong flavour but will still have all your calories and electrolytes. If you have a special formula for running (for example no-protein and some caffeine), we suggest using a fuel belt. Just take the bottle and fill it up right to the very top with your custom mix. Then add a little water to make a heavy concentrate. When you get to an aid station, just squirt a little into a cup of cold water. You can get 1500-2000 calories in 4 bottles. That is a super easy way to carry a ton of calories with not a lot of weight. Hope this helps, if you have any questions drop us a line. Happy Training and Thanks for your continued support. We appreciate it.